I'm a bit delayed this year in commenting upon the ID Match results—go here for our prior posts on this topic (and the broader issues affecting recruitment into our specialty). IDSA has a good summary of the results, and the figures below are taken from that article. The overall message is: the dumpster fire is no longer raging, but the dumpster is still smoldering! 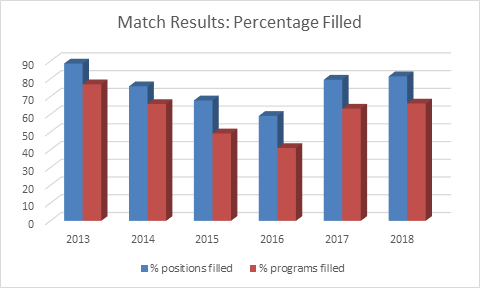 We've basically held steady since the new “all-in” Match started last year, with similar percentages of programs and positions filled. How to interpret the numbers? I think the “all-in” rules have reduced some (most?) of the outside-the-match ‘strategery’ that some programs and applicants were practicing. Thus after a couple years of “all-in”, we have a more accurate picture of the supply-demand relationship for ID training. 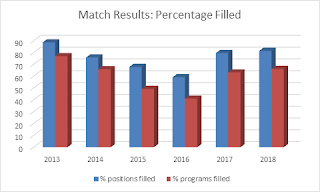 This picture is far from pretty—a third of programs are going unfilled, representing one in five of our training spots. Clearly, “train longer to make less” is still a difficult reality to overcome, even for a specialty as fascinating and fulfilling as ID. So we have a lot of progress to make, and it will have to be made against some pretty stiff headwinds. 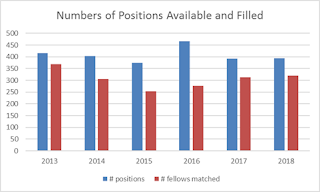 Easily lost in the numbers is the substantial proportion of positions filled by international medical graduates. This is a great thing in my view, bringing diverse experience and perspective to our programs—but it also makes demand for ID training highly vulnerable to corrosive political forces that may make it less inviting to come to the U.S. for training and employment. If international medical graduate numbers fall, the dumpster fire will rage anew. Finally, the political landscape will undoubtedly also shape the U.S. health care system in ways that are unpredictable, but which could reverse some of the trends favorable to ID (e.g. focus on population health and value, with requirements that promised to provide more fulfilling job options for ID—stewardship and infection prevention among them). The strong anti-regulatory mood of the current administration, along with increases in the uninsured population, could reduce incentives for health care systems to invest heavily in quality and safety. To sum up, this year's match should serve as a continued call-to-action, as we still have huge challenges ahead as a specialty.